Oratorio on passages from the Holy Bible and the Catholic liturgy. Composed by Franz Liszt (1811-1886). Edited by David Friddle. This edition: urtext edition. Paperback. Barenreiter Urtext. Vocal score. Duration 2 hours, 10 minutes. Baerenreiter Verlag #BA07680-90. Published by Baerenreiter Verlag (BA.BA07680-90). ISBN 9790006528349. 27 x 19 cm inches. Language: Latin, Text Language: Latin. 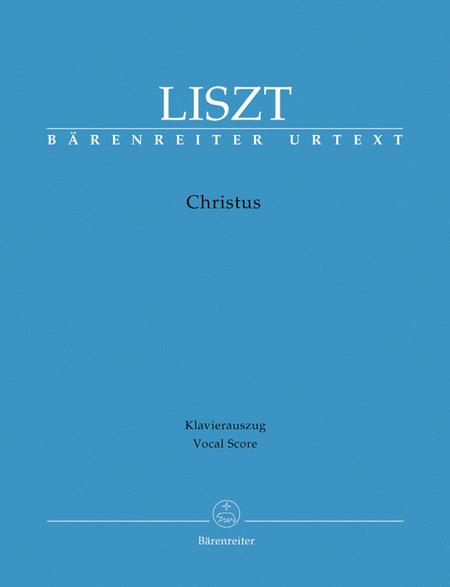 Franz Liszt's"Christus"is an attempt to capture in music the life of Christ from his birth to his Passion and Resurrection, thereby following in the tradition of Handel's biblical oratorios. Despite the familiar subject matter, Liszt was concerned less with depicting Jesus's deeds than with producing an object of meditation. To this end he employed a full array of musical devices to create a work abounding in sharp contrasts: symphonic textures alongside simple hymns, modal harmonies alongside bold chromaticism and varied combinations of voices and instruments alongside purely instrumental groupings. David Friddle's new edition is the first to publish the original text of"Christus"on the basis of all available sources. His extensive introduction also sheds light on the performance practices of Liszt's day. 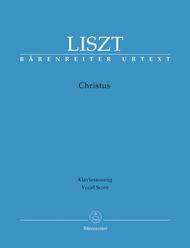 Our vocal score contains a German translation of the original Latin as a guide.